1. Put your phone in Airplane mode while charging to significantly cut down on charging time. 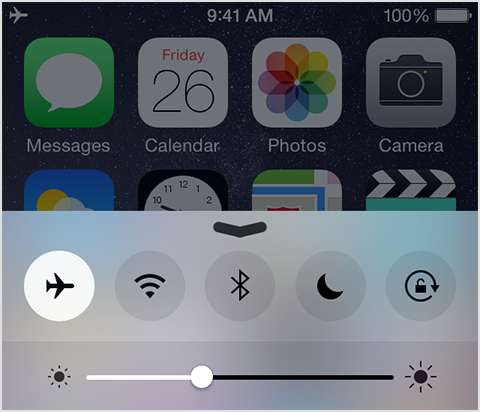 Swipe up from the bottom of your phone and tap the airplane icon to go into airplane mode. This is great if you need quickly charge. It makes the charging time “fly” by — see what we did there? 2. Give your phone a quick jiggle to fix a mistake. While writing an email, text, or editing a photo, shake your phone if you make a mistake and get this little guy prompting you to undo what you just did. Note: Shaking harder will not un-send a text you didn’t mean to send. 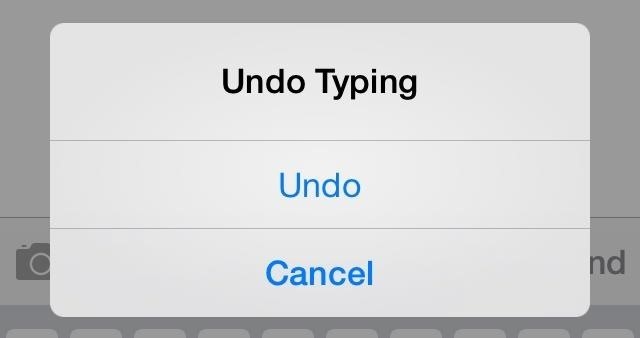 Just tap and hold the Compose button in your email application to quickly access your drafts. We have rewritten many an email because we didn’t want to take the laborious steps of finding the draft. So this one is a personal favorite. This one is great. 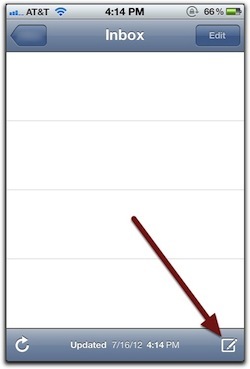 Get your audio playing (music, audiobooks, whatever) then set a timer in the Clock app. Under the “When Timer Ends” section, instead of choosing a sound, choose Stop Playing. That’s it! Now you can take a nap while listening to your most guilty pleasure playlist (Christopher Cross, Spice Girls, Justin Bieber, and the like) and make sure it turns off before anyone comes home to hear it! Thanks iPhone! Did we miss any other life saving tips? So, after 3 straight months of Minecrafting (with periodic breaks to Google questions nobody cares about the answers to) it’s time to go back to school. These Nerd approved school supplies will help you get through the next 9 months in nerd style! 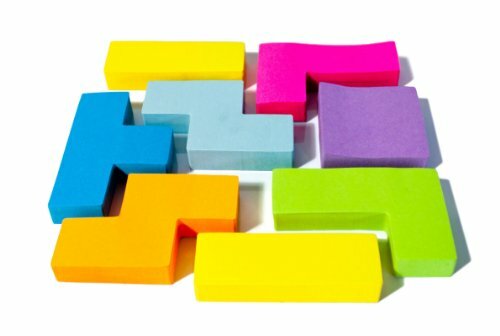 Not sure how functional these are (unless you already write in an “L” shape) but we LOVE the idea of them. We think that to add to their authenticity, it should come with a bunch of L’s, T’s, Z’s and squares, but only a couple of straight lines! Show off your true colors with these supply pouches. Sure, 3.5″ disks haven’t been used since you installed the original Wolfenstein, and there’s probably an app where you can snap a picture of an angled line instead of using a protractor, but that’s what makes them great! Relive your glory days through your children’s school supplies! Mustaches are classy, we all know that. But it’s important to make sure everyone knows how classy you are even when you’re not around! These mustache paper clips are perfect for holding together your lists of favorite Cabernet Sauvignons or your autographed Marx Brothers photographs. Attaching them to any written document automatically adds an implied British accent to whoever is reading it. You have to keep your gaming chops up while you’re at school. You think your opponents on the other side of the globe are allowing their thumbs to get lazy? No. They’re not. They’re keeping them in tip top condition with thumb cozies, regular stretches and a gamers diet (Cheetos and Mountain Dew.) This calculator will give you the edge you’ve been looking for. It also maths for you too. If you’re breaking out a notebook, chances are something boring is about to happen. These Lego notebooks will help you spice it up a little. It comes with some pieces you can actually rearrange to make your own creation. Best part is, they’re squishy – so stepping on one won’t mean your life has literally ended. This lunchbox has the unique ability to produce a different lunch every time you open and close the lid. You just keep opening it until you find something you like. This is powered by its proprietary Chameleon Circuit. We have heard, however, that many units are shipping with a faulty Chameleon Circuit and just produce peanut butter and jelly every time. 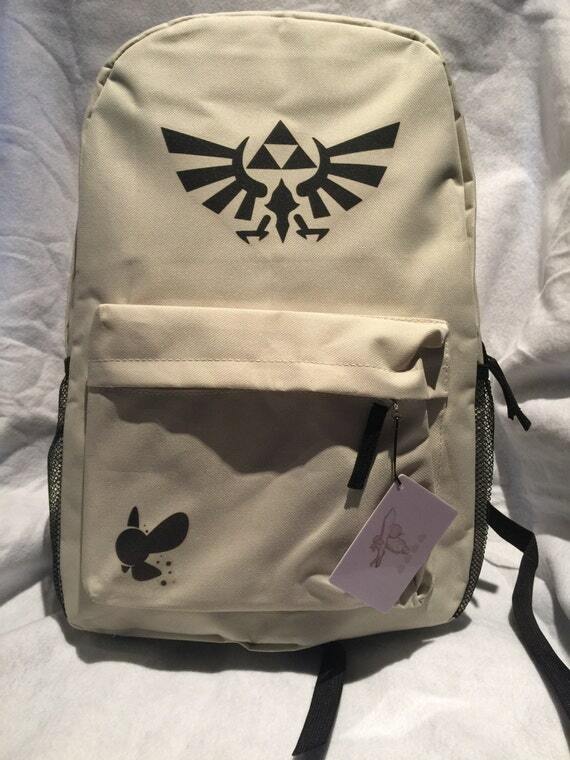 The ultimate nerd school supply. If being nerd is defined in any way – it’s caring about certain things more than anyone really should. And this proves it. Shaking out your keyboard isn’t enough. Using a can of air isn’t enough. You need a putty that slowly molds itself to your electronic device and picks up every last spec of dust. From your keyboard, your phone, game controller, whatever. There is one thing we found it’s not great for picking up though……….girls. Tell us what other unconventional school supplies we missed??? DON’T be Kirk Hammett! Backup your data! Kirk hammett – lead guitarist for metallica – lost years worth of song ideas because he didn’t back up! Yep, this really happened. Kirk Hammett actually said that one of the reason for the LONG delay between albums is because he lost his phone where he recorded song ideas and never backed anything up. Do we really even need to write a paragraph on the importance of backing up? I don’t think so. So let’s just jump right into some easy solutions & explanations to keep you up and running. iCloud is Apple’s solution to keep all of your Apple devices in sync. It automatically backs up things like App Store purchases, photos, documents, contacts and more and makes them available to all of your other Apple devices. If you want to work on a document from your computer then pick up where you left off later on your iPad, then iCloud is your solution. Who should use it: People that exclusively use Apple products and want all of them to be in sync with each other. Who should not use it: People that use no or few Apple products and are looking for traditional backup of files without any sort of syncing. Picturelife is for backing up photos and video only. But while it is limited to only photos and videos, it handles those extremely well. A subscription with Picturelife will cost just a few dollars a month, and for that you get a service that will automatically backup every picture and video you capture on every device you have. You can access them anywhere as long as you have an internet connection. Their website and app interfaces are great for viewing, editing & sharing all of your photos & videos. You can even search your library using English search terms – i.e. “videos in Los Angeles”. The backup is automatic & fast. Who should use it: People that are only concerned with ensuring that their pictures and videos are never lost. Who should not use it: People looking for a full backup solution beyond pictures and videos. The options for hard drives are endless here. You can get huge capacity and fast speeds now for relatively reasonable costs. And this is probably one of the most straight forward ways to completely backup the entire hard drive of your computer exactly as is. In fact, most operating systems (Windows & OSX) have software that will automatically handle the backup process for you if you keep the hard drive connected. And while this is a very traditional form of backup and it will backup everything you have, it does have some significant limitations. Unless you have a home network setup, the hard drive will only backup computer it is connected to. Setting one up to backup from a mobile device can get tricky and doesn’t always work as expected. It’s still a physical device in your home. So if the disaster that requires you to revert to a backup also took out your hard drive, you’re out of luck. In general, external hard drives are a great supplement or Plan B to another backup solution. Who should use it: More technically savvy people that know exactly what they want backed up – and how. Also people that want extremely fast and easy access to their backed up files without actually having to completely revert to a backup of everything. Who should not use it: People that want an automated one-stop-shop for having everything secure and backed up off line where nothing (almost nothing) can hurt it. There are endless solutions for backing up your important files. These are just a few of the different types of backup solutions available. Your best bet is finding one you find easy to jump into and maintain – because even the best backup solution doesn’t mean anything if you don’t use it consistently. Friends don’t let friends lose their files. So, save a file, share this article. And tell us how you protect your files! How to approach your logo design? Logo design is truly an art. Taking a company, an idea, a concept, a passion and representing it with a single image is no small task. It requires a true understanding of what is at the heart of the organization and the skill to translate that into a universally recognizable image that will evoke emotion in everyone that sees it…..but not just any emotion……the right emotion! What is your desired reaction? The first step of evoking the right emotion in people is deciding what the right emotion is. When people see your logo do you want them to feel Excited? Happy? Cared For? It’s not enough to just say that your company represents all of these things – I’m sure it does! But what makes you stand out? What is different about you? Why should your potential customers choose you over your competitor? When you have that answer, THAT is the emotion you want to evoke. How do you create this emotion? Once you have determined what is the right emotion / feeling / reaction you want to convey through your logo, you can move on to actually creating it. This is where it gets fun. First, look for inspiration. This doesn’t mean copy someone else’s logo; it means look at other logos that make you feel the way you want your customers to feel and get some ideas of what they have in common. In general, laid back casual feelings will have more earthy tones & colors and softer, rounded edges (or no edges at all.) Exciting logos will create movement. How colorful should it be? Not at all. Of course logo design is artistic and there is no right or wrong, but this a very useful rule of thumb. Design your logo in black & white! If your logo can’t translate well to black and white, it will be very limited in its uses. This rule came about during the days of printed media, faxes, etc. when black print was the only option very often. While that’s not the case anymore, the rule still stands strong. A logo that can be represented by a single color (such as black) with negative space making up the rest (white) your logo will be endlessly versatile. Your designer should not need to rely on a huge color palette to create the desired effect. This does not mean your logo cannot have color. Color is not a bad thing. But it should be able to easily translate into black and white. Be sure, however, that your colors are there for a purpose. Just because your logo includes a banana in it doesn’t mean the banana needs to be yellow. Just because there is a rose doesn’t mean it needs to be red. Logos are not literal representations, they are art. Use color for a purpose. Different colors convey different emotions. Red conveys the strongest emotions: Love, Passion & Anger. Green is calm and soothing. Blue is trusting and secure (it has a wide range depending on the shade.) The science of colors is a completely separate article in itself. The key here is don’t use color just to use color. Make it count. Detailed? Or not so much? Not so much. Again, this is of course a matter of opinion, but there’s good reason for our opinion – we promise! While the ability to create large, detailed images has become much easier in recent years through design software, the way in which we see these logos has actually gotten smaller. Logos are viewed on computers screens now – often as profile pictures on a social media page. Or a favicon (the small logo inside the address bar on your browser). These are TINY! And that’s on a computer screen. Now imagine all of this on a phone or tablet. Even tinier! The shape and outline of your logo should be recognizable even at these sizes. Keep the detail to a minimum. A single shape or silhouette can speak volumes! Ok, just tell me what my logo should be! We can’t just guess what should be included in your logo. It all comes down to everything you read above to decide what image(s) convey the right message. But what we can tell you is don’t be shy to think abstractly. Think of a creative way to represent the first letter of your company name. Think about what you really DO at your core. So you’re a personal trainer. Yes, you train, you help clients build muscle, lose weight, etc. But what you DO is change lives. What you DO is teach people how to take care of themselves. What images convey those core aspects of what you bring to people? So think hard about what you really do. How you impact people, animals, the environment, whatever and send that message. And very importantly, make sure you’re working with a designer that’s willing to take the time to figure out what you truly DO before creating a single sketch. What great tips did we leave out? What did you learn during the process of designing your logo? So, you want a free shirt? Our t-shirt giveaway is completed. We are catching up on the backlogged requests but we are not taking any new ones. Thanks to everyone that participated and all the photos of you guys rocking your nerdy shirts! Check back here soon for the next giveaway! Blogging is an art form. There’s no right or wrong for the most part. There are popular blogs about feet, and unpopular blogs about the Kardashians. So, why this huge disconnect? It really comes down to one simple philosophy: Don’t talk…listen. So what does that mean, right? How can you blog without talking? You can’t. You have to talk. I’m talking right now – to you. But the trap people fall into very often is that they blog about what they want to talk about. And if your goal is to be the only subscriber to you’re blog, then that’s no problem. But, if you’re hoping some other human being will read what you’re writing, then you need to listen, listen, listen. You need to write what other people want to read. I want to write about the creative process we went through on a particular website design that took forever. They want to read about how to deal with a difficult client. I want to write about the amazing evolution of mobile technology in such a short time. They want to read about the latest mobile device and its pros & cons. I want to write about the art of songwriting and what how great it feels to play the guitar. They…….don’t want to read anything remotely related to that. Your audience is king. Period. You need to listen to them and write for them. Do a little research. Don’t spend the next 6 months researching (you could easily do this), but do some research. See what people like to read. What are some of the most popular blogs in your category? What are some of the most popular blog posts on those sites? What are people sharing on social media? This is your research. It gives you a window into the mind of your audience. You’ll likely find that what most people want are short, easily consumable articles. Lists are great. “Top” this, and “Worst” that. Those are things that are easy to jump into and consume. Step by step how to’s are also great. But while I’m telling you what you’ll likely find, don’t listen to me. Do you’re own research with your own audience. Trust me, if you listen closely enough, they will tell you very clearly what they want to read. What do you see your audience asking for? SEO is like fine wine…it gets so much better with age. And now, at the ripe age of 20, it has hit its peak — much like me. What is SEO? SEO stands for Search Engine Optimization. And it basically refers to methods and practices used to ‘help’ search engines find a website. Put simply, SEO is the blanket term for hundreds of different things people focus on to drive more traffic to their website. Why is it important? See the previous sentence. The first real search engine site is created. Webcrawler uses a program (referred to as a spider) to “crawl” through the internet one site at a time and see what’s happening on each one. It ranks the top 25 sites across the internet. Some other search engines are actually updated by people. Yes real people sifting through the internet and ‘ranking’ sites. Google pops up. I could end the story here, but I’ll keep going. Google improves on how sites are ranked by looking at backlinks. Backlinks are basically other sites that point to your site. For example, if you create a website dedicated to the movie Top Gun (thank you, by the way, for doing that) and your neighbor creates a similar site, the old search method would rank you roughly the same. But let’s say that 100 other websites around the internet are “talking” about your site. And by talking about it, I mean they have a link to your site somewhere on their site. These are backlinks. Google looks at these and decides that your site should rank higher. It gets a little more complex than this, but you get the idea. So, a whole bunch of time goes by and the algorithms used to rank sites gets better and better. But at its core, it is still pretty much based on links, keywords, and other things that are somewhat easy to fabricate. If you can fit the word “chocolate” on your website more than the next guy, this helps your ranking when someone searches for “chocolate.” You can buy thousands of fake back links for a few dollars. And in general, there are various ways to “fool” the search engines. During this time, Google continually improves how its search works and actually penalizes companies for using these tactics to fool their rankings. Companies like BMW & JC Penny lose their high ranking because of the tactics they use. Google introduces Google Panda. There is a lot to explain here, but the long and short is that Panda is a new approach to ranking that focuses on the quality of the content of a site, and not quantity of keywords or links. The specifics are of course closely guarded, but it’s clear that if you are producing quality, unique content regularly, Panda will like you. The biggest mystery is why they called it Panda. I mean, pandas are black and white which seems to contradict the ‘grey’ area Google is now looking to for ranking a site. Also, a panda eats one food. One food — it’s entire life — one food! Again, seems to go against the idea of creating unique & diverse content. Personally, I would have called it Puma, but that’s just me. Over the last few years, Panda (and other search products & variations) have continued to improve. So what does that mean for SEO today? It means that the internet has caught up with thousands of years of business. Before computers existed, people had businesses. And if you wanted to keep customers coming back, you needed to do quality work and keep your customers happy. That is finally true for the internet. If you want to keep people coming, you need to put the work in. SEO now means creating content for your website that is relevant, timely and unique. Keep producing content. Write articles & posts people want to read — and more importantly, share! Share them yourself on social media. Then repeat. You will start to build a loyal readership which will translate into traffic on your site, which will translate into higher rankings on search engines, which will translate into higher traffic on your site —- are you seeing the cycle here? There are still tips and tricks for great SEO, but they’re no longer ways to “work” the system. They’re ways to entice and engage your audience. What are some of the SEO techniques you have used? How have they worked? Using social media for your medical practice can be daunting and a little tricky to navigate. But it has becoming an absolute necessity to build a practice and is one of the most effective ways to gain a large and loyal base of patients and promote more word-of-mouth business. A survey by PricewaterhouseCoopers showed 41% of people are open to sharing their information with health care professionals via social media, and 61% said they trust information they receive via social media! And 70% said they would like to receive help from health care professionals via social media – including referrals! These numbers speak for themselves – and they are growing every day! Patient Specific Question. These are the questions where someone is asking you very specifically about their condition or symptoms. For example, you see: “Dr. Caresalot, I woke up this morning with a horrible feeling in my chest and when I take deep breaths I feel a sharp pain. What should I do???”. You DO NOT want to respond directly to this post within your social media page. These are situations where you want to send a private message to the person, without any specific diagnosis or advice, but advising that they schedule an appointment as soon as possible. If they can do this online through your patient portal, send them the link there. If you can include days that might be more available, that is also very helpful. The key here is to not provide any advice but provide a solution so they can get the help they need. And very often you are that solution. Urgent / Critical Need. These are rare but they do pop up. This is when someone is coming to you with an urgent (possibly life threatening) question or situation. In those circumstances, the best way to handle them is to call that person as quickly as possible to discuss their situation. If you do not have their contact information, send a private message asking for it. If you simply cannot call, you can respond privately that they need to seek immediate medical attention. Again, these are very few and far between. Most people do not go straight to social media when they have something life threatening happening. But be prepared. Here’s the million dollar question…..what do I post??? Well, it’s easier than you think. You’re already in a unique position in which you hear from your customer base constantly about things they’d like to know more about and specific questions they have. Always be on the lookout, every day, for a patient question that you think others might want to know more about. You of course don’t want to post about a specific patient or situation, but if you hear a question or concern that you don’t always have the time to expand on, a Facebook post (or blog post that you ‘share’ on Facebook) is a great place to expand on the topic. You can treat this the same way you’d write any other publication piece – general information & suggestions. Listen for common misconceptions. You hear these all the time. Address them via social media. If you’re always hearing “Oh I always have a stomachache, it’s no big deal…” address that. You can’t diagnose it via social media, but you can absolutely let everyone know that something chronic like this may be a sign of something bigger and they should see their doctor. You can even make it fun & eye catching, like titling the post “Misconception of the week” or something like that. People love to stay informed and know a little more about a topic than the next person! How-To posts are always a hit. These can be Facebook posts, quick Twitter posts, a full blog post, or even a YouTube video. The specific How-To you put together is of course dependent on your specific area of expertise. It might be a quick way to self-diagnose, a generally accepted & globally safe ‘relief’ (not cure) for some minor ailment, or even a how-to of how to get the most out of an appointment with their physician; what questions to ask, etc. This information is extremely valuable – especially when coming from an ‘insider’. Social media is all about engaging your audience. Ask questions, solicit feedback and always encourage participation. You can have a ‘Q&A’ session via Twitter or Facebook (ask people to post question, then pick one to address.) Even better, make it a recurring event that people can count on — something like “Ask me anything Wednesday”. Ask people to share their experiences and things they found to be helpful. This will stimulate conversations that occur completely within your social media environment. Also keep an eye out for recent medical news and publications that your audience might find interesting or helpful. You will often be aware of new developments sooner than your audience would be so share it. Let them become ‘in the know’ sooner than their friends. This is what is referred to as providing “social capital” and it’s what people are constantly looking for on social media. Finally, if someone is particularly pleased with their experience with you, ask them to share it on your social media pages. You don’t need everyone to do it, but if you don’t ask, you can rest assured that no one will do it. Not much to say here other than don’t be a flash in the pan. Don’t post twice a day for a couple of weeks then once a month after that. 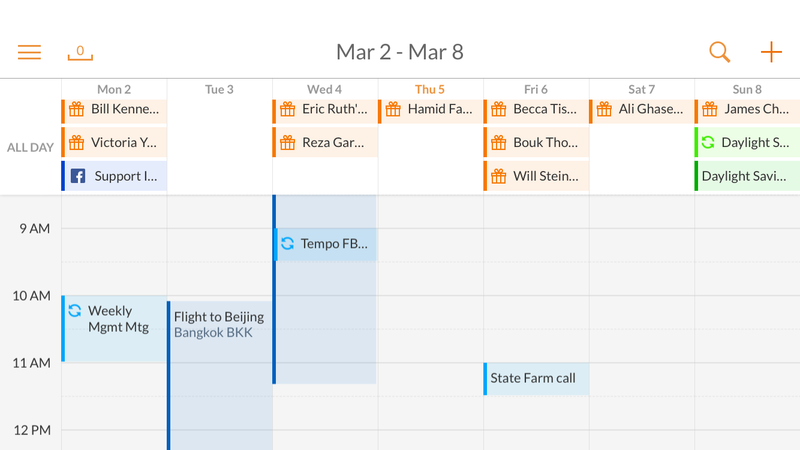 Establish a schedule you can stick with, and STICK WITH IT. Your audience likes consistency and reliability. You don’t need to post every single day (although that would be great) but you need to post regularly with fresh content, and you need to stay roughly within your schedule so your audience doesn’t forget about it. Be consistent. Oh – and be consistent. And final word of advice, be consistent. What has your experience been managing social media for a medical practice? We’d love to hear your thoughts!